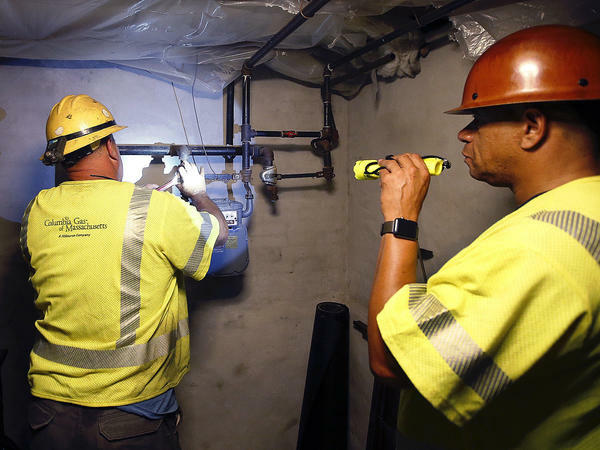 Columbia Gas employee Brian Jones shines a flashlight so his partner, can shut off the gas in a home on Sept. 14, in Andover, Mass. On Tuesday, lawyers filed a class action lawsuit on behalf of thousands of residents impacted by last Thursday's gas explosions and fires triggered by a problem with a gas line that feeds homes in several communities north of Boston. Lawyers filed a class action lawsuit on Tuesday against the company that operates the gas pipelines linked to a rash of explosions and fires that rocked the Massachusetts towns of Lawrence, Andover and North Andover last week. The complaint, which names Columbia Gas and its parent company, NiSource, as defendants, alleges "antiquated" gas lines in unsafe conditions caused the over-pressurization of the system, leading to "catastrophic consequences." "We're filing this on behalf of the 8,600 residents that were displaced from their homes beginning on Thursday," Frank Petosa, one of the attorneys who brought the case, told NPR. It is for "people who feel they're sitting in a ticking time bomb," now that they've been told they can return to their homes because "there are no answers yet as to what occurred," Petosa added. "The community deserves assurance that this will not happen again." Despite the return of thousands of people to the affected communities, many remain indefinitely without access to hot water. NiSource declined to comment on the pending litigation, but Ken Stammen, a spokesman for the company told NPR, "We are fully committed to responding to the needs of people who are suffering because of this incident." Stammen noted that NiSource on Tuesday contributed $10 million to a disaster recovery fund intended to provide housing and support services for impacted residents. Hours before the spate of fires and explosions that killed one person and injured more than two dozen others on Thursday, pressure in the gas pipelines running through three towns registered at 12 times their normal level, according to the state's U.S. senators. In a letter sent on Monday by Sens. Elizabeth Warren and Ed Markey to executives at Columbia Gas and NiSource, the senators said they had been briefed about the over-pressurization of the gas distribution system in the northern Massachusetts towns by the federal Pipeline and Hazardous Materials Safety Administration. "The gas pressure in the Columbia Gas system should have been around 0.5 pounds per square inch (PSI), but readings in the area reached at least 6 PSI — twelve time higher than the system was intended to hold," the letter said. The spike was registered in a company-run control room in Columbus, Ohio, the National Transportation Safety Board told the senators, who are now demanding a timeline of events from the moments the surge was recorded. "We write to request that you provide us with information in order to help the American people understand why this terrible disaster occurred, whether the company was sufficiently prepared to respond to an incident of this magnitude, and how we can prevent any similar tragedy in the future," Warren and Markey wrote. They are asking if company personnel reported the pipeline irregularities to the National Response Center within an hour of discovery, as is mandated by state regulations, and whether they followed other established state and local protocols. Additionally, the senators are calling on Columbia Gas to account for a four-hour time lapse between the initial outbreak of explosions at about 4 p.m. and the company's acknowledgement of the disaster at 9 p.m., which ultimately led to the destruction of 80 structures, the death of 18-year-old Leonel Rondon, and dozens more injuries. Stammen told USA Today that NiSource is cooperating with state and local investigators and intends to respond to the senators' letter by their Wednesday deadline. "We're as anxious as anybody else to learn what went wrong last Thursday," he said.